Once upon a time I thought that the more toppings a pizza had, the better it was. I still enjoy most of the toppings that go in a supreme pizza but now I’d rather have a good simple pizza than an all-you-can-eat meal on an average quality dough. I used to pack a pizza with mushrooms, capsicum, tomato, ham, salami, cheese, tomato pizza sauce, onion, olives, and pineapple (if available). Since then I’ve learned that in Italy (Naples specifically), authentic pizzas can only have dough, tomato sauce, cheese and basil leaves. I think many of us in the Western countries have been side-tracked about what’s important in a pizza. I think it’s the dough. The Naples regulations require the dough to be cooked in a woodfire oven for 60-90 seconds. While the toppings are very important also, the make-or-brake aspect of the pizza is definitely in the dough. Many consumers of average grade pizzas will probably make the mistake of thinking that more toppings equals more value for money and that quantity of ingredients adds to the taste. A similar thing happens to Italy’s espresso style coffee. While we should be more concerned with the espresso shot, we get distracted by all the things we can disguise the taste of the espresso with. The short black, ristretto, double ristretto is the essence of what coffee is however, we add milk to this, sugar, and some people go as far as creating a peppermint mocha (heaven knows what goes into that). In summary, we should go back to basics with cooking and hot beverages. Find out where they came from, how they evolved and try to capture the integrity with which these meals first came into creation. If there’s no appreciation for the food’s history, preparation and original authenticity then how can you really enjoy it? 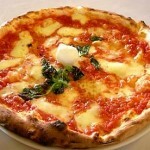 This entry was posted in Cooking and tagged margherita, Marinara, Napolitana, pizza by Reinaldo (old posts). Bookmark the permalink.